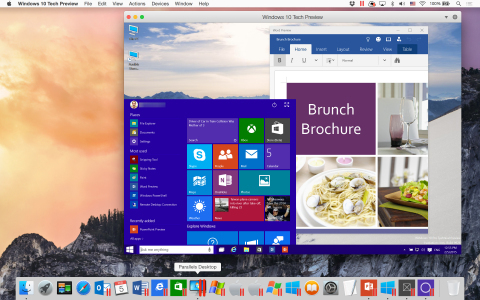 RENTON, Wash.--(BUSINESS WIRE)--Parallels announced today that Parallels Desktop 10 for Mac (parallels.com/desktop) provides experimental support for Windows® 10 Technical Preview and Office Preview for Windows 10 which includes Word, Excel and PowerPoint. Now users who wish to try the newest OS from Microsoft® safely and easily can do so without the inconvenience of deleting an existing OS or the uncertainty of installing a new and nonfinal version of Windows 10 directly on their machines. The Parallels Wizard makes it simple to download the Windows 10 Technical Preview directly from within Parallels Desktop, creating a virtual machine to try out everything Windows 10 has to offer, including such features as the new Start menu, Photos, Maps app, Cortana and Windows Store beta which offers Office Preview for Windows 10. “Parallels Desktop enjoys very strong support among software developers and IT pros. We are happy to deliver all the tools they need to quickly and safely test or run the latest OS and applications, now including the Windows 10 Technical Preview,” said Parallels president Jack Zubarev. Early adopters who want to try out Microsoft’s latest OS and offer feedback have the option to do so in Parallels Desktop without having to erase their existing OS. Mac® users can download a free two-week trial of Parallels Desktop and use the Parallels Wizard to install and try the free Windows 10 Technical Preview today. Parallels focuses on giving its customers choice. With Parallels Desktop, users have the freedom to choose whichever operating systems best fit their needs—including OS X® Yosemite, OS X Mavericks, OS X Mountain Lion, Windows 8, Windows 7, Chrome™ OS, Android and a number of Linux operating systems—all on one computer. The latest release of Parallels Desktop for Mac (10.1.4, build 28883) is required for this experience with the Windows 10 Technical Preview (build 9926). Parallels Desktop 10 for Mac is available at parallels.com/desktop. The standard retail price (SRP) of Parallels Desktop 10 is $79.99, and the Student Edition is available for $39.99. Upgrades for existing Parallels Desktop 8 or 9 customers are $49.99. Parallels Desktop 10 customers receive a complimentary three-month subscription to the Parallels Access™ app (parallels.com/access) for up to five Macs and PCs and an unlimited number of iOS and Android mobile devices. Parallels Desktop for Mac Enterprise Edition is available via parallels.com/business. Stay connected with Parallels and our online communities: Like us on Facebook at facebook.com/parallelsdesktop, follow us on Twitter at twitter.com/parallelsmac, and visit our blog at blogs.parallels.com/consumertech. How to run the free Windows 10 Technical Preview and Office Preview for Windows 10 on your Mac safely with Parallels Desktop 10 for Mac.